Chelsea midfield stalwart Cesc Fabregas has confirmed that he has signed with Puma, and it’s sparked excitement among some AC Milan fans. As noted by Calciomercato, the 31-year-old has been heavily linked with a move to join the Rossoneri, as he is currently struggling to establish himself under Maurizio Sarri. 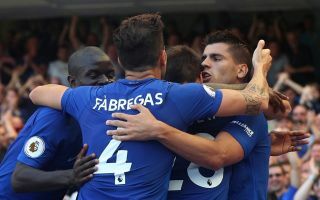 With a lack of playing time so far this season coupled with the fact that his current contract is set to expire at the end of the season, it seems as though an exit is on the cards for Fabregas, but it remains to be seen whether or not he’s able to reach an agreement on a new deal in the coming months. However, as seen in the tweet below, he has confirmed that he’s signed with Puma, who are also the official kit sponsor for Milan. In turn, some fans of the Italian giants have put two and two together, and believe that it could edge him a step closer to joining Milan either in January or at the end of the season, as seen in the tweets below. Time will tell if that happens, but given the current injury problems that Gennaro Gattuso is facing in that department with Giacomo Bonaventura and Lucas Biglia long-time absentees and the lack of quality depth behind them, January reinforcements would likely be welcomed. Milan are currently battling to finish in the top four in Serie A this season to secure a return to the Champions League, Adding Fabregas with his experience, leadership and quality in midfield could be a crucial move, and perhaps him joining up with Puma could be a way to make a touted move to Milan a smoother switch. So happy to sign a new 4 year deal with @acmilan. They have always made me feel like part of the family and delighted that we are continuing are relationship together. ?? ?? So now enjoy the Puma Family at Ac Milan ?? @pumafootball help us to bring this baller to Milan ?? Cesc come to AC Milan, we are waiting for you ??? DIAMOGLI LE CHIAVI DEL CENTROCAMPO ??? ?